No wifi network is perfect, but Milo makes every wifi network better. Milo is a brand new, amazingly simple whole-home wifi solution that intuitively balances speed and coverage to fit your unique array of devices and spaces, whether at home or in your small business. Wherever your current router struggles to reach through walls and leaves you buffering, Milo uses proprietary SmartSeek technology to intuitively spread the signal where it's needed, when it's needed. With the help of Milo's easy-to-use app and simple lights, setup is a cinch and Milo starts enhancing your coverage right out of the box. Two Milos stationed around your home or business work together to spread strong, reliable coverage over up to 2000 sq. ft. And Milo keeps getting better on its own while maintenance remains minimal, with automatic software and performance updates pushed from the cloud. Our team of Internet industry veterans has fine-tuned the fundamentals to bring you superior performance at half the price of competitors. The result is wifi at its highest potential, for the lowest cost. 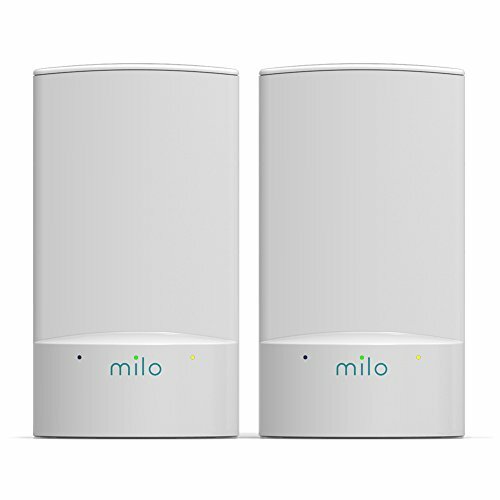 Milo is the newest, most affordable distributed wifi system that enhances the coverage of any existing wifi router. Two Milos work in synchrony to cover the average home or small business, or up to an additional 2000 sq. ft.
No need to plug Milo into your wifi router. BaseLink technology lets Milo connect wirelessly from the edges of your existing network, adding coverage where you need it. SmartSeek constantly checks your connections and reroutes them when there's room for improvement, creating a dynamic network optimized to cover all your devices in every room. Required for setup: internet service and modem. Recommended: Supported iOS or Android smartphone with data connection. If you have any questions about this product by Milo Wifi, contact us by completing and submitting the form below. If you are looking for a specif part number, please include it with your message.